For those areas within the UNINCORPORATED parts of Los Angeles County within the Santa Monica Mountains Coastal Zone, this application will help you see how the maps certified as part of the Local Coastal Program (LCP) effect its properties. These maps include data regarding biological resources, scenic resources, recreation, hazards, rural villages, land use policy, and zoning. The easy-to-use interface provides jurisdiction information as well as zoning data for properties in the Coastal Zone’s unincorporated areas. Our data is for unincorporated portions of Los Angeles County only. If the property for which you need information is in one of the County’s 88 cities, you will need to contact that city or try its website for the information you need. Please check the County’s website with a link to all 88 incorporated cities for city contact information. If you need more types of information on unincorporated properties or advanced tools and functionality, please try our suite of GIS Web Mapping Applications. Please send direct feedback regarding the functionality of this application to the Department of Regional Planning GIS Section. Questions regarding the LCP should be sent to the Department of Regional Planning Community Studies East Section. Why can I search only in the unincorporated areas? 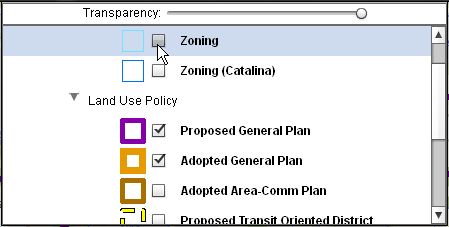 Each city’s planning department develops its own zoning and land use codes. These data are not shared with Regional Planning, which is responsible only for land use planning in areas outside any incorporated city. What if the property I am interested in is in a city? If the property is in a city, the data you need should be available through that city’s planning department. Please see the County’s site for contact information for all 88 incorporated cities. What does the Land Use code mean? When you use the ‘identify tool’ on a layer (see help portion of this document), you get basic information about the Land Use Category. To get a more detailed description about the Proposed General Plan Categories, click here. For more detailed information about the Adopted General Plan or Area / Community Plan categories, click here. What does the zoning code mean? If the property in which you are interested is in the unincorporated Coastal Zone area, please review the LCP’s Local Implementation Program (LIP) available at http://planning.lacounty.gov/coastal or contact our Land Development Coordinating Center. If the property is in an incorporated city, please contact that city’s planning department for information. How can I find out what uses are acceptable on a property? Why is the map all white where I zoomed/searched? Regional Planning does not have data for properties in incorporated cities. If the map is masked where the property is located, you will need to contact the planning department of the city shown. Please see the County’s site for contact information for all 88 incorporated cities. Why can’t I see all of the layers at one time? To make the map easy to read, the amount of information shown at each zoom level is limited to what is large enough to see. The more you zoom in, the greater the detail displayed. I want to use the Identify tool, how do I switch between layers? Click on the Layers button to display the list of layers, then click on the name of the layer you want to use with the Identify tool. Only one layer may be selected as the identify layer. What is the format of the address search? Entering all pieces of the address will maximize the accuracy of the search. Searches with the address and either the city or the zip code also work well. What is the format of the intersection search? How do I get information about a property? The Identify tool permits you to get information from any of the map layers. Click on the Layers button to display the list of layers, then click on the Layer Name of the layer you want to use with the identify tool. Only one layer may be selected. Click on the property for which you want information. A results pop-up box will display the layer information for the property you clicked on. If the results window is not entirely in view, pan the map until the box moves to a position where it can be read. Click any link in the results box for future information about that field. What if I don’t know the address or the APN of the property? Use the Select Your Community box to narrow your search to the unincorporated area where the property is located. Zoom in, using either the slider bar or the Zoom in tool as needed until you can read the street names. You may also enter a street intersection in the search box in the format “street and street, city name or zip”. You must have a city or zip or it may not find the intersection. Use the Pan tool to move around the map until you find the property you are looking for. Use the Identify tool to get the property information. How can I see what the area around the property looks like? Click the Imagery button to display our aerial photography from 2008. What if there is a label covering up what I want to see? Use the Pan tool to move the map slightly. The labels will repaint and you should be able to see the property more clearly. What if I don’t want to see all the layers? Click on the Layers button to display the list of layers, then click in the Visibility column to turn off (uncheck) or turn on (check) layers. Click on the Layers button again to close the list. Can I print my map? Yes. 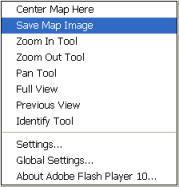 There is an option to ‘Save Map Image’ if you right click on the map. You can save and then print that image as needed. NOTE: For a full list of department-wide FAQs, please visit the Department of Regional Planning FAQs page. Help button Click this link to get to the current document. Legend button Click this link to open a description of the zoning and land use codes. Zoom In tool Click and drag the mouse across the area you are interested in to frame your area of interest. The map will zoom in and center on the area you framed. Zoom Out tool Click and drag the mouse across the area you are interested in to frame your area of interest. The map will zoom out and center on the area you framed. Pan tool Click and drag the mouse to move to another part of the map. While you are dragging, a target will appear indicating what is currently in the center of the view. Full View button Click this button to return to the original view of the county. Previous View button Each time you release the mouse after panning or use one of the search methods to move around on the map, a new view is created. Click this button to go back one view. The button may be clicked repeatedly to backtrack. Identify tool Click on a property to get information about that property. Click on the Layers button to change the information source. Each time you switch layers, you will need to click on the map again. 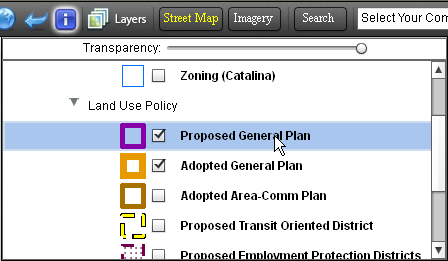 Click on the legend button to learn more about the zoning and land use codes displayed. Layers List and Legend button Click this button to change which layers are visible on the map (click in the Visibility checkbox), see how each layer is symbolized (Symbol column) or select which layer information is provided to the Identify tool (click on the Layer name). Click on the button again to close the list. Street Map button Click this button to display the map view. When the font is yellow, it is the current view. Imagery Map button Click this button to display the County’s most recent aerial imagery. When the font is yellow, it is the current view. You may also search by entering the 10-digit Assessor’s Parcel Number (APN). Then click the find button to zoom to the property. If it is in an unincorporated community, you can get additional information by using the Identify tool. If it is in a city, the area will be masked in white and you will need to contact the planning department of the city shown. Community Select Box Click and drag the mouse across the area you are interested in to frame your area of interest. The map will zoom in and center on the area you framed. Please send direct feedback regarding this application to the Department of Regional Planning GIS Section.